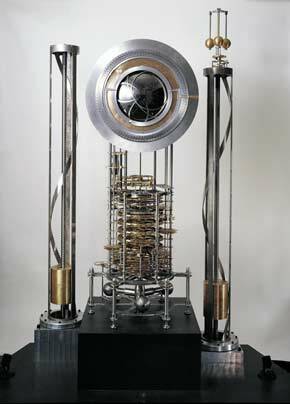 This first prototype of the 10,000 Year Clock is currently on loan to the Science Museum of London, and can be seen as the final piece in the “Making of the Modern World” exhibit. This prototype began to tick on December 31, 01999 after an almost three year research and design effort. Following lead designer Danny Hillis, the team included project manager and designer Alexander Rose, mechanical engineer Liz Woods, horologist David Munro, and lead machinists Chris Rand and Erio Brown. Power for the Clock comes from the two helical weight drives on either side of the Clock. The timing for the Clock is generated both by a torsional pendulum, with a one minute period, and by a Solar Synchronizer that re-calibrates the Clock to solar noon on any sunny day. To correct from solar time to the absolute time of the pendulum there is a special Equation of Time Cam. The display on the Clock is made of two elements; the Serial Bit Adders and the dials. The Adders convert the timing generated from the pendulum, using their binary mechanical system, to changes in the Clock's dials. The six dials represent the year, century, horizons, sun position, lunar phase, and the stars of the night sky. The Clock was primarily designed by Danny Hillis, additional design work and project management by Alexander Rose. Engineering and part drawings were done by Elizabeth Woods. The Escapement and movement were designed and built by David Munro and General Precision Corp. Almost all other Clock parts were machined and assembled at Rand Machine Works. All engineering for the Clock of the Long Now is done in Pro Engineer courtesy of PTC. The Long Now Foundation thanks them for their support. Starting from the outside, on the right side of the dial viewed through a gold "window"indicator is the Gregorian year in 5 digits. 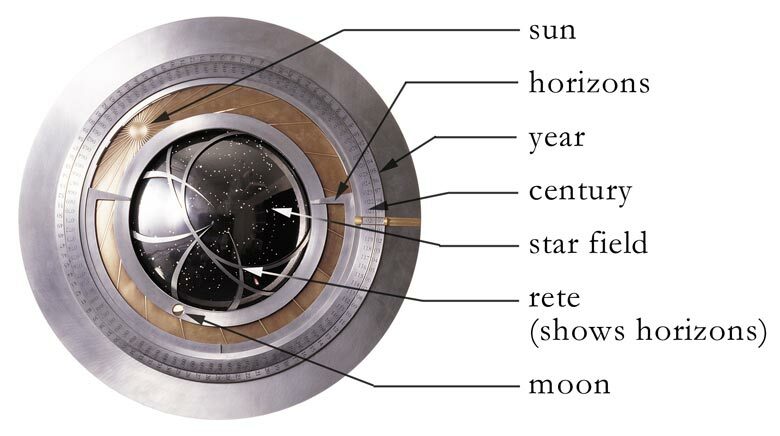 This would read "02009" currently, and is made up of two rings, one showing the century or the "020" part, and the other adjacent outer ring with the "09" year part. At the center is the black domed display of the night sky overlaid by what is traditionally called a rete. The rete has indicators that show the range of night sky visible from upper and lower latitudes as well as some pointers that point to the celestial pole (currently very close the "North Star" or Polaris). This domed night sky is actually set on a 23 degree angle behind the face as it has to rotate on that angle roughly once every 26,000 years as the earth precesses on its axis. Further down inside the clock is also a "mundane dial" that shows normal 12hr clock time, this is mainly a debugging device to be sure it is accurate. Also near this dial is the Equation of Time Cam which allows for the clock to be adjusted to solar time even though it is keeping absolute time. Free for download*, the entire set of drawings used in creating the first Clock Prototype. These drawings are in their original AutoCAD r14 DWG format. They are separated into four numbered part groups (4000, 4200, 4300, and 4400) and we have included an excel master part spreadsheet. The master assembly drawing is in the 4400 group and is called 'Assembly Fold'. If you need a viewer for this type of file there are freely downloadable ones available. Free for download*, the entire set of drawings used in creating the first Clock Prototype. These drawings have been converted to Acrobat PDF format in a single multipage file. You can also reference the excel master part spreadsheet. The master assembly drawing is in the 4400 group and is called 'Assembly Fold'. You will need Acrobat to view the files which is freely available here. * All drawings are copyright 01997-02002 to The Long Now Foundation and are provided for personal use only. Within these drawings are multiple design and utility patents that are property of The Long Now Foundation. For printing or reproduction please send enquiries to services@longnow.org or call 415.561.6582.